The Sahara Sea is a hypothetical macro-engineering project that proposed the usage of the waters from the Atlantic Ocean or Mediterranean Sea to flood the Sahara's endorheic basins. 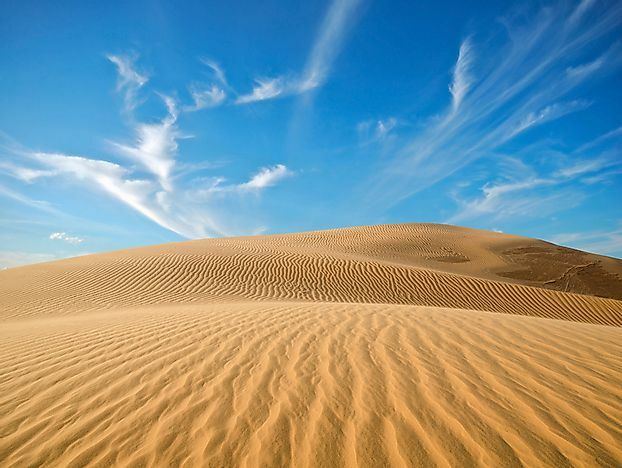 Getting water to the arid Sahara Desert continues to be a challenge to this day. What Is The Sahara Sea? The Sahara Sea refers to a proposed project to flood the drainage basins of the Sahara Desert with water from the Atlantic Ocean and the Mediterranean Sea. The idea behind this project was that this man-made sea would make the surrounding climate more hospitable to agricultural endeavors. Supporters of this inland sea believed it would increase the surrounding air humidity and cause rain to fall. The Sahara Sea project was a popular notion between the late 19th century and the early 20th century. Donald Mackenzie, a British engineer, first proposed the Sahara Sea project in 1877. He wanted to turn the El Djouf basin into the Sahara Sea. This basin stretches across northeastern Mauritania and northwestern Mali and sits at 200 feet below sea level. Mackenzie’s plan involved digging a channel to direct water from Cape Juby in Morocco into the basin, creating an inland sea with an area of 60,000 square miles. This original Sahara Sea plan also included an additional channel, running from the inland sea to the Niger river. Geologists believe that the El Djouf basin was once connected to the Atlantic Ocean. The following year, Francois Elie Roudaire and Ferdinand de Lesseps suggested a similar idea for the Chott el Fejej in southern Tunisia. In this plan, the basin would be filled with water from the Mediterranean Sea via a channel from the Gulf of Gabes. This project cost was estimated at $30 million. Opponents of the Chott el Fejej project argued that an inland sea would do little for the surrounding climate and instead, would create a swamp-like environment to harbor insects and disease. The government of France sent surveyors to the area and discovered that the basin was not completely below sea level. Its funding was denied. The fervor to create a Sahara Sea died down until around 1910 when Etchegoyen, a professor from France, again suggested creating an inland sea. The channel in this plan was designed to be deeper and longer. Etchegoyen suggested it would be beneficial to colonization efforts. The French government again declined to fund such a project. Operation Plowshare, a US initiative to use nuclear bombs for peaceful development purposes, suggested using nuclear bombs to flood the Qattara Depression in Egypt. It also suggested flooding the chotts of Tunisia with water from the Mediterranean Sea. Before the project could be realized, however, several international treaties were enacted to ban the use of peaceful nuclear detonations. The Sahara is not the only desert in the world that engineers and geologists have considered flooding. Around the same time the Sahara Sea was proposed, scientists and engineers were making plans to flood the South Australian desert by connecting Lake Eyre to the ocean via a long canal. Additionally, the Salton Sea in the southern area of the US state of California was created in 1905. This sea, however, was accidentally created when an irrigation canal unexpectedly flooded a dry basin with water from the Colorado river. The Salton Sea, a saline lake, continues to be the largest lake in the state.